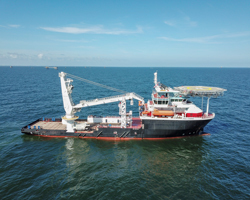 Candies Shipbuilders of Houma, Louisiana has launched an IRM ship for its parent group, Otto Candies.The 5,771gt vessel, christened Paul Candies, measures 101.25m x 20.6m and was designed by Marin Teknikk, deploying that architect’s MT6020 layout. The ship was classed by Lloyd’s Register. Vessel features include: a maximum draught of 6.25m; accommodation for 90 persons, split between 32 single and 29 double cabins; 1,050m² worth of cargo deck space; a 7.2m x 7.2m moon pool; a helideck; a Huisman deep-sea crane, with a SWL of 250tonnes at 12.5m; and tankage for 1.15 million litres of fuel oil and nearly 703,000litres of fresh water. Paul Candies has been equipped with four CAT 3516C engines, rated 2,250kW apiece, and a CAT C32 engine, rated 910kW. Schottel, meanwhile, supplied the vessel with two SCD 560 STP Combi Drive azimuth thrusters, designed to share the load between two propellers for increased propeller efficiency and reduced fuel consumption, as well as two STT 5 FP bow thrusters (rated 1,050kW each) and a single SRP 260 R FP retractable bow thruster (rated 800kW), to support the vessel when it is operating in DP mode. Paul Candies has a reported service speed of 12knots, increasing to 14knots max.